I’m talking about this other blog here. I’m determined for this blog to join Sky Watch Friday, since I love to take pictures into just anything. I could share the captured pictures here from this remarkable world we have. That means, I won’t wait for another Friday just to make sure I have posted both brilliant Sky we have here. And I’m glad I did. This was taken at night, when I dazzled by the brilliant worked of nature. Hope you like the view. Happy Friday World! Looks like you got lots of snow as well, great shot. You almost didn't need a flash for this shot with all that white in the scene. And this in November too? Can't imagine what it must be like now! wow, this is very god capture Nova. ka cute pud ana imong pic sis oi. nice ang effect. na nice na color pero gusto ko sis tag 15 pesos lang hehehehe. kay pobre mi wa sapi. saon bisan noodle halos tag 1 dollar. hayyy nakakamiss ang presyo sa mga baligya sa pinas. hehehhee. Beautiful shot. 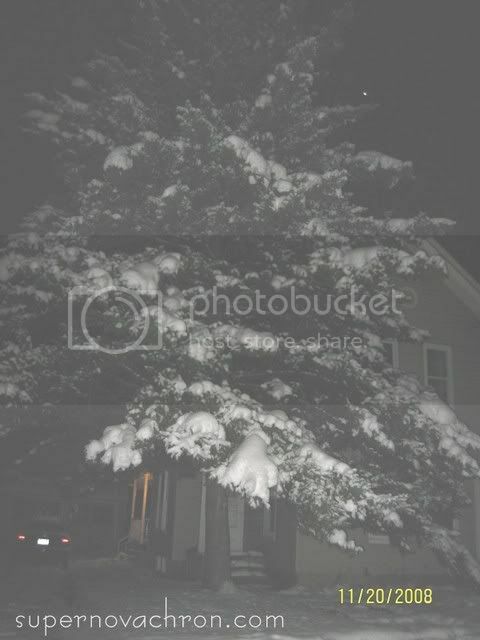 I like the effect of the snow on the trees at night.